Conrad’s Javan Carroll clears the bar set at 5’10” during the Fairfield-Belt Invitational track meet on Saturday at Memorial Stadium. 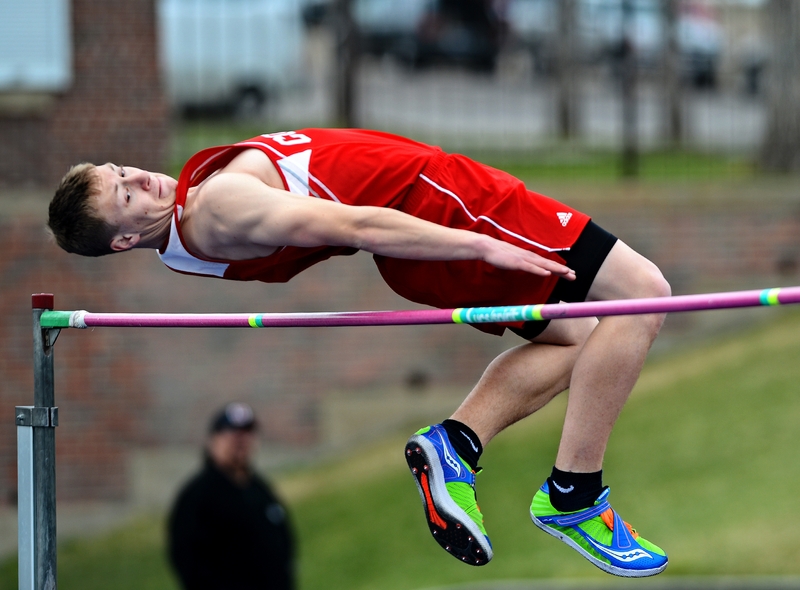 Saturday featured track meets galore as many Class B and C schools descended on the Electric City for the Fairfield-Belt Invite. The meet went on despite heavy winds that canceled the pole vault. That likely would have helped out Cascade considerably since the Badgers tend to dominate the small-school pole vault world in Northcentral Montana. We’ve got a story and a video for your perusal. Belt coach Jeff Graham was missing several members of his teams because of a DECA conference, but said most teams are “in the same boat” this time of year. Nevertheless the Belt girls won the team title while Chinook took the boys’ title thanks to four victories by Dylan Surber. The CMR and GFH track teams were in Helena, where the CMR girls placed second overall to Billings West. Anna Weber won the100 and was second in the 200 in what look to be shaping up as key races for the state meet next month. I’ve also got some more stuff on Brian Crosby’s hiring as the CMR girls’ basketball coach. He has experience coaching both boys and girls though he’s spent the past eight years coaching boys in some form or fashion. Crosby, whose family includes wife Jordan and young son Cooper, said girls listen better to their coaches. Crosby’s hiring ought to set up some interesting contests with Gregg Dart’s squad over at GFH. During his days as a KRTV sports anchor, Crosby covered Bison football which was coached by Dart at the time. Crosby said he has always admired Dart’s coaching acumen. “I know the standard that people judge you by in Great Falls is how you do in crosstown games,” Crosby said.